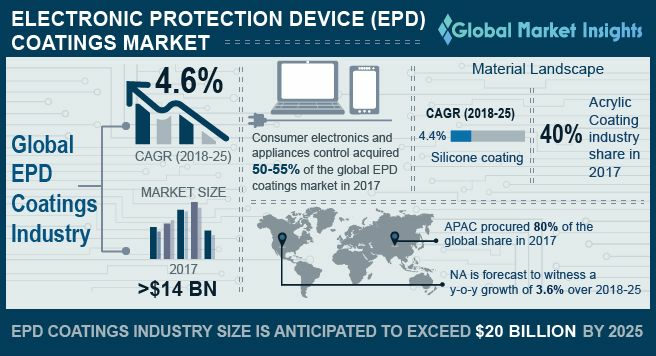 Electronic Protection Device Coatings Market size will surpass USD 20 billion by 2025; according to a new research report by Global Market Insights, Inc.
Electronic protection device coatings are the polymers that are applied to printed circuit boards (PCB) in thin layers to electrically insulate and protect the components from environmental stresses such as moisture, chemicals, dust, debris etc. These coatings can be applied by various techniques which are majorly brushing, dipping, manual spraying or automatic spraying. Acrylic is the most commonly used Electronic protection device coating material in the electronics protection industry (almost 70-75%) as it is available at a cheaper price as compared to other chemistries and have good environment protection properties. They are widely used for coatings PCB’s in consumer electronics, appliances and white goods industry. Also, they have wide operating range and can adhere to wide range of substrates such as LED boards, electrical generators, relays, cell phones, avionics among others. The U.S. acrylic coating market for electronic protection is USD 520 million by end of forecast period driven by robust demand of computers, laptops & smart phones and other household electronics. Polyurethane coating is another electronic protection device coating material, which offers excellent chemical resistant and protection in harsh environments. They also maintain flexibility at low temperatures and can be used on wise range of substrates such as PCB, electrical generators, fire alarm components, automotive electronics, motors, transformers among others. The global polyurethane coatings market for electronic protection device is expected to reach almost USD 800 million by 2025. Epoxy coating is another important type used for electronic protection such as electrical connectors, relays, marine industries, farming, mining among others. Epoxy coatings are very hard and are good at resisting moisture & have excellent chemical resistant. Silicone coatings are used for elevated temperature applications to protect against moisture, dirt, dust and corrosion. These coatings find applications in automotive electronics, oil & gas, transformer industry and elevated temperature environment. In others, paraxylene coatings is used for aerospace and defense application mainly satellites, spacecrafts & also in medical devices. Automotive is one of the fastest growing application for electronic protection device coatings market, as the market is primarily driven by increased demand for safety & comfort features, rise in luxury car sales especially in developing economies & rapid technological advancements which require heavy use of electronics. It is estimated that by 2024, the global car market would reach more than 110 million worldwide driven by electrification in automotive industry especially innovation in electric and hybrid vehicles, recovery of European markets mainly Russia and Ukraine, steady demand from Asian countries especially India, Malaysia. Overall the demand of electronic protection device coatings is expected to grow by 4-5% each year till the forecast period in the automotive application. Asia Pacific is the largest electronic protection device coatings market as almost 80-90% of PCB manufactured are made in China, Japan, South Korea, Taiwan, Singapore among others. Asia Pacific is forecasted to be the fastest growing market driven by increased demand of smart electronic appliances, steady demand of white goods and growing industrialization. Also availability of low cost raw material & cheap skilled labor, global companies are shifting their attention to low cost countries such as Malaysia, Thailand, Vietnam among others to set up manufacturing base.